Always keep in touch my love from dawn 'til setting sun"
Take A journey through the blue green door and share the intensity and passion, the gentleness and love woven through these lyrics and sung by one of Ireland's most genuine singers. 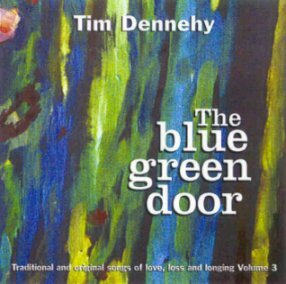 Tim's album, "The Blue Green Door", is a collection of 13 tracks ranging from original compositions, political songs and amhráin Ghaeilge to poetry set to music. Tim is once again joined by Garry O'Briain who plays guitars, mandocello, keyboards and harmonica and who produced this tracks also feature Jesse Smith (viola and fiddle), Liz Johnston (cello), Tommy Keane (Whistle) and Áine Derrane (backing vocals). And the heartbeat of these ancient stones. The Blue Green Door (Songs of Love, Loss and Longing Volume 3).